Florenz Ziegfeld Jr was one of the many complex individuals who shaped American theater. When writing about a glitter merchant such as Ziegfeld, it’s easy to become blinded by the flashing bright lights that surrounded him and produce a volume filled with hyperventilating hyperbole. The Brideson sisters avoided that trap and provided the annals of theater history with a finely crafted biography. The authors spent almost a decade researching and structuring the volume and the work shows. The biography is a virtual waterfall of information presented in a clear and accessible style. The waterfall sometimes overwhelms, and such academic tomes sometime threaten to drown the casual reader; however, the plainspoken style of the data flow is the book’s saving grace. 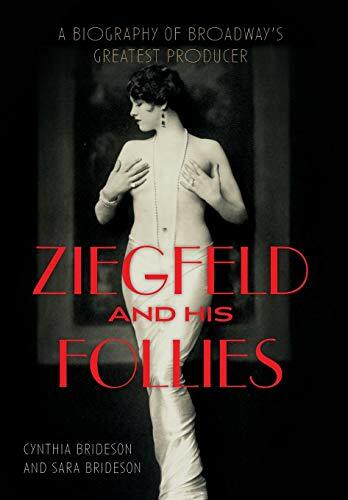 The authors use primary sources, such as previously unpublished letters, and a variety of attributed references and quotes to recreate moments from Ziegfield’s life. We get glimpses of his marriages, his lovers, his business dealings, and his visions. Ziegfeld Jr was the oldest son of a German-born graduate of the famed Leipzig Conservatory of Music founded by Felix Mendelssohn. The elder Ziegfeld created a respected music school in Chicago, and when he visited Germany with a selected group of his students, was honored with a luncheon thrown by Franz Liszt. The younger Ziegfeld seemed to have been skipped by his father’s musical genes and musical interests. His father’s conservative point of view and the daily grind of managing a music school never caught the budding producer’s attention. Instead, he concentrated on popular appeal and sought to find out what attracted audiences. The formula he discovered included lots of comedy, novelty, and a strong flavoring of semi-prurient naughtiness. There was absolutely nothing unique in his approach, but Ziegfeld learned to apply it with a magic touch. The biography describes numerous failures and close calls in the producer’s prodigious production history, but he never gave up. As a result, he was able to introduce such songs as “Shine on Harvest Moon,” “Making Whoopee,” “Second Hand Rose,” and all the songs from his hit musical, Show Boat to the American cultural landscape. Of course, the list goes on and on. The often imitated format of his yearly Ziegfeld’s Follies show influenced generations of choreographers including Hollywood’s Busby Berkeley, and the myriad creators of Las Vegas-style musical extravaganzas. Ziegfeld discovered such stars as French singer Maurice Chevalier, and boosted the careers of Eddie Cantor, Fanny Brice, W. C. Fields, Will Rogers, and others. He is reputed to have been a difficult but loyal employer. The Great Depression ravaged Ziegfeld’s empire of showy spectacles, and he died in 1932 without ever attaining his previous heights. But his name still drew audiences and posthumous versions of the Ziegfeld Follies included such stars as Bob Hope and Milton Berle. The Brideson sisters do great justice not only to their subject, but also to casual readers and researchers on scholarly quests.